Wall Street stocks rose early on Thursday as the market sought three straight positive sessions ahead of Apple earnings and a closely-watched US employment report. 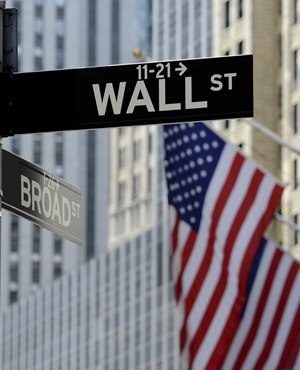 About 10 minutes into trading, the Dow Jones Industrial Average stood at 25 270.02, up 0.6%. The broad-based S&P 500 and tech-rich Nasdaq Composite Index also climbed 0.6%, the former rising to 2 726.69 and the latter to 7 351.80. US stocks finished a dismal October on a positive note, rising both on Tuesday and on Wednesday, with analysts saying stocks had been oversold following a rout spurred by worries over slowing earnings growth, higher US interest rates and increased geopolitical risk. The market faces a host of potential catalysts in the coming days, including Apple earnings after today's trading session, the October jobs report on Friday and the midterm congressional elections next Tuesday. Apple shares were down 0.1% early on Thursday. Among other individual companies, DowDuPont shot up 7.1% after reporting third-quarter earnings of 74 cents per share, three cents above analyst expectations.